The Author would like to acknowledge the financial support from the FIG Foundation in Copenhagen and material support from the Department of Geomatic Engineering at the University of Zambia (UNZA), without which carrying out this research would have been very difficult. Since 1992 when the world’s governments realised the need to protect the environment, sustainable development was adopted as a general principle for policies and actions that had a bearing in the environment, and one cannot talk about environment without talking about land on which activities that affect the environment mostly take place. Issues of sustainable development strongly depend on surveying, planning and management of land processes that deal with accessing and securing tenure of land. Surveying is thus a fundamental activity on one of the major components of developmental capital; land, with which Zambia as a country is well endowed. However, in recent years some malpractices have been encroaching into the professional practice of land surveying. This research therefore endeavours to bring to the fore white collar malpractices that have recently crept into the land delivery process which if left unchecked would have untold effects on our much cherished environment as has been seen in the mushrooming unplanned settlements where the developers have no security of tenure at all and their activities on land are not controlled in any way. The system that facilitates acquisition of secure tenure on land is flawed and the resulting security and development is unsustainable. In turn the development undertaken thereon is not secure. Hence, the developers tend to put up development that is not long term and which does not conform to environmental needs for a sustainable earth. A good cadastral survey approval system is thus a sure measure of stability in development, as security of tenure of land on which it will take place is assured. This was already realised at the United Nations 1992 Rio Conference on Environment and Development where the need to protect the world’s environment was agreed with the concept of Sustainable Development as a general guiding principle for policies and actions in a large number of fields and sectors of society [FIG Agenda 21]. The World Commission on Environment and Development defined sustainable development in their report on “Our Common Future” as, “Development that meets the needs of the present without compromising the ability of future generations to meet their own needs” [FIG Agenda 21]. This meant protecting the natural environment and improving the social situation of the poor and combating poverty. Land surveying is therefore deeply involved in issues of profound importance to sustainable development to improve the social situation of the poor by combating poverty. One such issue is that of land delivery and security of tenure without which sustainable development cannot be realised. The issuance of a Certificate of Title to land for a 99-year lease period is based on an approved survey diagram compiled from a field survey carried out by a Land Surveyor. In this context a Land Surveyor is one who is licensed to do so by the Survey Control Board [Land Survey Act]. The Surveyor General or his appointed Government Surveyors approves the survey after a rigorous examination of the survey records submitted by the land surveyor. A Government Surveyor is a licensed Land Surveyor who is in government employment and is so appointed by the Surveyor General [Land Survey Act]. This research therefore looked at the current system of cadastral surveying and its approval so as to identify any flaws and their effects on secure land tenure and sustainable development and recommends feasible remedies to mitigate the effects. This research is of particular importance to sustainable development in that it hinges on the security of tenure, which in itself is a critical factor for sustainable development without which the developer may not sustainably develop the land. It is hoped that the findings of this research would help greatly enhance the land delivery system that would be free of potential conflicts and secure by an unquestionable Certificate of Title thereby guaranteeing environmentally friendly development. All land in Zambia was held under customary laws before the arrival of the white settlers. This changed with the arrival of the colonialists who wanted to hold land using the system they left at home, the British legal system [Mulolwa 2002]. This brought in what was then called crown land, which was held either on Freehold or leasehold, and native land under customary laws. Today land is still administered with this dual system with crown land having changed its name to state land. In 1975, all freehold estates were converted to 99-year leases through enactment of the Land (conversion of titles) Act. Land could thus not be sold except for the improvements on it. As such land in Zambia is held on leasehold in state land and under customary laws in customary areas. However there is a provision for converting customary land into state land with the consent of the customary leaders (chiefs). Land may also be held on a fourteen-year lease using just a sketch to generally describe the land parcel in question. This lease is normally looked at as just a facilitating tool for development as arrangements for a longer lease are being made. There is also a 30 year lease given out based on a sketch plan in resettlement schemes. A 30-year occupancy license is also given within housing improvement areas under the Housing (Statutory and Improvement Areas) Act, 1975. Occupancy licenses are given out by councils who hold a block title to such land. The longer lease is for a period of 99 years and can only be granted after an accurate survey of the land parcel has been carried out, hence the need for a survey diagram. A survey diagram is one of the three cadastral plans that are part of the survey records for a particular survey of a land parcel for purposes of obtaining a certificate of title. It is thus a document that contains geometrical, numerical and verbal descriptions of one or more parcels of land, the boundaries of which have been surveyed by a land surveyor and which document has been signed by such land surveyor or which has been certified by a government surveyor as having been compiled from approved records of a survey or surveys carried out by one or more land surveyors [Land Survey Act]. It includes any document, which prior to the commencement of the Land Survey Act had been accepted as a diagram in the Lands and Deeds Registry or in the office of the Surveyor General or his predecessors. One needs to get a 99-year lease for a newly offered parcel of land. In this case a new survey is undertaken for the purpose. One needs to transfer from a 14-year lease to a 99-year lease. In this case a new survey is undertaken for the purpose. One needs a separate title for a subdivision from a parent parcel of land. In this case a new survey is undertaken to excise off a part of an existing parcel of land. One needs to replace a lost 99-year lease. In this case a so-called duplicate title is issued using diagrams that a recompiled from the original approved survey records held by the Surveyor General. The compiled diagrams are called Certified True Copies (CTCs) whose use is conferred by authority under section 33 of the Land Survey Act. Cadastral Surveying is concerned with the charting of land to accurately define its boundaries for purposes of obtaining a certificate of title to that land. In Zambia, cadastral surveying is governed by the Land Survey Act under which a Survey Control Board, which regulates the practice of Cadastral Surveying, is constituted. The Land Survey Act restricts the practice of cadastral surveying to only licensed surveyors who are called Land Surveyors. The Surveyor General may appoint Land Surveyors in government employment as Government Surveyors. Government Surveyors are the ones who approve cadastral surveys on behalf of the Surveyor General, who is the top most Government Surveyor. Since the cadastral diagram is a legal document, the survey from which it is compiled is examined in the examinations section of the Survey Department. The Chief Examiner heads this section. He has about six other examiners under him. Once the planning authority has approved development of particular parcels of land, that plan is forwarded to the Ministry of Lands for numbering after which advice on commissioning land surveyors to carry out the survey is given to the client. The commissioned land surveyor then carries out the survey, prepares the necessary records and lodges them for examination at the Zambia Survey Department (ZSD). After examinations, the job is either returned to the land surveyor for corrections or it’s passed on to the Government Surveyor for approval. The Land surveyor then collects the approved survey diagrams and hands them over to the client who uses them to request for their Certificate of Title from the Lands Department. All other materials (the written survey report, field book, computations book, working plan and general plan) become public property and remain with ZSD. These are used to update plans and for general consultation by other land surveyors and others who may need the same information. These records are kept in the Plan Room. The Plan Room is so called since this is where all the cadastral plans and records are kept. At present all the data is in hard copy form. Any data search for cadastral survey records takes place in the plan room. The plan room also acts as a reception area for the ZSD. It is usually the first point of call for all sorts of clients to the ZSD. It is in the Plan Room that numbering of plans is done on request by the Lands Department. Requests for Certified True Copies (CTCs) of approved diagrams are also made in the Plan Room. The Plan Room, in short, handles all sorts of requests pertaining to cadastral surveys and filters them to particular sections, which deal with them. It is therefore in the plan room that land surveyors lodge their jobs for examinations and collect them after examinations. The plan room is the focal point in the movement of the survey job for examination in that after the job has been lodged for examination, it is registered and given a survey record (SR) number and then forwarded to the examinations section (Chief Examiner). After examinations, with necessary comments (either return to land surveyor or pass to approval) the job is brought back to the plan room where it’s forwarded to the next person in line. FIG 1. A survey job's flow from planning to collection of approved diagrams. After approval by the Government Surveyor, the Plan Room forwards the job to the Reprographic Section to make a disaster copy for every approved diagram, a process called “stat filing”, after which the job’s computer records in the alphanumeric database are updated so as to now show the survey details of that previously unsurveyed land. These are details like diagram number, survey record number, land surveyor, extent, date surveyed and so on. After all this, the survey diagrams are then ready for collection by the land surveyor who lodged them. The plan room falls under the examinations section and is headed by an examiner who is called the Plan Room Supervisor. Fig. 2. 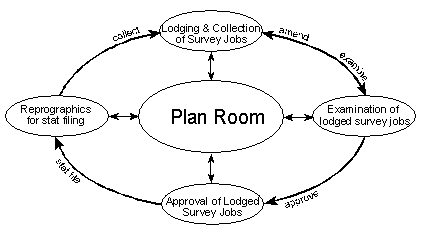 Plan Room as the focal point in the survey job examination process. This section, which is headed by the Chief Examiner, who reports to the Assistant Surveyor General in charge of Cadastral Services, is responsible for scrutinising cadastral survey jobs before a government surveyor can approve the survey. The examination focuses on the correctness of the methods used, preparation of reports and plans and whether carried out in accordance with the Land Survey Act and its regulations. The job is either passed on for approval or retuned to the land surveyor for amendments as per findings of the examiner. After being lodged, the survey job is put in a durable folder called a Jacket upon which every officer who handles a particular part of the job endorses his or her signature and comment. The contents of the Jacket are also endorsed on it. In addition, when survey jobs are lodged for examination and brought to the Chief Examiner, he enters them in his register and distributes them to his examiners who report back their findings to him so that he keeps track of the examinations process noting the findings in his register. Jobs for examination are therefore supposed to enter and exit the section through the Chief Examiner. The research focused on the period 1996 – 2003 for these malpractices became noticed after land transactions were given monetary value. Previously only developments on land could be sold and not the land itself on which the developments were. This addition of monetary value to land became more visible with the sale of government, parastatal organisations and council houses to individuals who in turn sold them at inflated prices compared to what they got them at. At the same time there was an immeasurable demand for land to allocate to those that did not benefit from the sale of houses. Prospective landowners were thus ready to lay their hands on anything that appeared to be vacant land at all costs. On the other hand, there was a cadre of prospective malpractitioners ready to pounce both on the potholed system and the desperate prospective landowners. The major problem in the system now is therefore that procedures are not followed at almost every level, leaving a lot of room for malpractices and infiltration of the system by malpractitioners who survive by destabilising the system further. This problem is not just a ZSD problem but also spreads to other Departments of the Ministry since there is no system for counter checking what is purported to come from the other Departments. Consequently fictitious surveys, surveys carried out in offices, existence of diagrams for non-existent land parcels and indiscriminate issuance of CTCs through total abuse of section 33 of the Land Survey Act became immensely noticeable. These malpractices thus gave rise to yet another problem of rampant disappearance of survey records, mostly involving such dubious surveys. The research started by reviewing a number of related articles to learn and see what might have been done before in Zambia. Minango (1998) in his thesis report outlined that, Dale (1976) included a review of the cadastral system in Zambia in chapter 10 of his book; Lilje and Nilsson (1976) looked at the backlog (reasons and consequences) of cadastral surveys and their future demand in Zambia in a Swedesurvey consultancy report; Mvunga (1980) traced the origins and development of land tenure systems in Zambia; Bruce and Dorner (1982) looked at land tenure issues in perspective, equity and productivity; Kagedal and Fagersten (1986) delved into appropriate mapping techniques for land held under customary tenure system; Fox (1989) covered issues of land delivery and Chileshe (1994) looked at a low cost approach to cadastre and land registration for land under customary tenure with emphasis on data acquisition. Chilufya (1997) in looking at a possibility of an integrated cadastral and land registration information system noted that delays in survey records examinations were due to lack of trust the system had in Land Surveyors. In other words, he alluded to the existence of white-collar malpractices in the system, which one would say the examinations process sought to eliminate. He recommended punishment for the erring land surveyors according to the law to instil trust in the work they did. Chilufya (1997) also recommended that the number of duplicate copies of plans maintained by the system needed to be reduced. This pointed to the fact that the system cannot adequately monitor activities based on these duplicate copies of plans due to their numbers and might therefore create a fertile ground for the noted malpractices in the system. In addressing the issue of delayed examination of cadastral surveys, Mulolwa (2002) recommends the use of an elaborate standard survey job submission form with adequate information to aid quick determination of its quality and hence approval. The Lands Tribunal, set up under the Lands Act of 1995 to expeditiously handle all matters relating to land, has so far not handled any dispute which could directly be attributed to the problem of white collar malpractices in cadastral surveying. It can therefore be seen that no research has solely been dedicated to identifying land survey malpractices inherent in the approval system or indeed the registration system, let alone the effects of these malpractices to secure land tenure and sustainable development. There was therefore need for this research. After literature review 112 survey records were randomly picked from the Plan Room covering the period 1996 – 2003 (see table 1 and appendix 1). From these records the following information was collected; parcel number, examiner, survey record number and who carried out the survey (government or private). Since each surveyed and approved plan has a Survey Record (SR) number, each parcel has an associated SR number. Accordingly, using parcel numbers from the randomly selected survey records, a search was conducted in the computer database to come up with the survey record numbers for those parcels. Another check was also performed using the survey record numbers to see if the survey records under scrutiny were for the same parcels of land. This was done to determine the extent of the problem (see appendices 2 and 3). Interviews with some system operators were also conducted through which some cases of these malpractices were identified. These interviews and mere observations also helped understand the system of cadastral survey approval and the public reception and complaints procedure now in place (see Table 2). However, instead of focusing on who the perpetrators were the research focused on identifying the flaws in the system and how they could be remedied. This was necessitated by the fact that it was difficult to extract information from people at a time when the country and the Ministry of Lands in particular was embroiled in issues of corruption, which in essence are the root cause of the very malpractices the research was focusing on. A government task force pursuing perpetrators of economic plunder was already in place and it was difficult for people to look at this research as an exercise aimed at improving the land delivery system for sustainable development and not a conduit for investigating people for prosecution. ‘exist’ means the parcel was proposed (numbered) to be surveyed but may not have been surveyed yet, or if surveyed is not yet updated in the database. ‘not exist’ means that the parcel was not proposed (numbered) to be surveyed in the first place. As such it does not even exist in the database. The search by SR numbers did not yield much as the computer database available has no capability to search using SR numbers. This was thus done using the examinations register, which is very outdated. there is abuse of section 33 of the Land Survey Act. Section 33 allows a government surveyor to approve a diagram or general plan if the same was framed from approved survey records filed with the Surveyor General’s Office (ZSD) or registered in the Deeds Registry without the signature thereon of the land surveyor who signed the original general plan or diagram if he is not available or unreasonably refuses to sign the general plan or diagram so framed. Through the use of this section fictitious or office surveys have been conceived and diagrams produced with forged approving signatures or indeed correctly signed by the unsuspecting government surveyor. Such surveys may even bear record numbers of other parcels just to make them look complete and real. This scenario presents itself on either a real parcel or indeed a non-existent parcel. Existing parcels are usually those that were previously held on 14-year lease using a sketch plan as a description of the land parcel. The malpractitioners then just sit in the office and scale off coordinates from a topographic map and insert them on a diagram and use other record numbers on it. It thus looks authentic and is presented for approval. Non-existent parcels are used in the case of a desperate prospective buyer who is promised a one-stop shop in acquiring the necessary documentation for the promised parcel of land. There is indiscriminate production of CTCs using the same section 33. This is sometimes done to circumvent paying of survey fee due to a land surveyor. In which case the malpractitioner pockets the small fee for production of a dubious CTC. CTCs produced to facilitate a dubious transaction of selling one parcel of land to more than one buyer and issuing all of them with diagrams. Survey records pertaining to questionable diagrams disappear from the plan room to obliterate incriminating evidence. It was also discovered that persons who masquerade as land surveyors perpetrate most of these malpractices aided by land surveyors who sometimes endorse their work as authentic when not, at a small fee, the so-called signing fee. The plan room though acting as a reception area to ZSD is actually not. As such a lot of confusion reigns presenting a fertile ground for the growth of these malpractices. Owing to the plan room acting as a public reception area to ZSD, it is difficult to monitor the movement of survey records, which sometimes fall in wrong hands. Some officers in the Department also personalise some survey records denying land surveyors and other interested parties access to the same. Landowners instead of the land surveyor they commissioned also usually collect diagrams directly from the plan room. Movement of lodged survey jobs is not properly monitored such that some jobs go straight to certain examiners with interest in them, a situation which compromises quality of work produced. In fact it is in such cases were records disappear soon after the job is approved. As such it is even difficult for the chief examiner to know which jobs have come in and gone out of his section for whatever reason. At the ministry level it was found that there is no way of verifying what Lands Department receives from ZSD as the diagrams are presented by the landowners. The same is true for the Lands and Deeds Registry. Although there exists an alphanumeric database in the ministry on matters of land, most line officers have no access to it. These flaws therefore make the perpetrated malpractices not easily detectable at the right time at the right stage to quickly nip them in the bud. Searches that were conducted on randomly picked survey records came up with 20.5% of records that were classified as existing but had not been updated and 11.6% of the records that were classified as not existing. The records labelled ‘exist’ are parcels that were numbered but not surveyed according to the computer database. Yet some of the parcels had their surveys approved 5 years ago. The records labelled ‘not exist’ are for parcels that were numbered and not indicated so in the database. They are thus not even supposed to be surveyed according to the database records. Yet again their survey records were approved. There is only one computer terminal in the plan room from where the alphanumeric database is updated and an excuse that it is inadequate may therefore be advanced. Whereas this is true, it does not hold water in that the so much talked about backlog cannot be properly ascertained since recent records are updated and old ones not. Therefore this anomaly in a system that is supposed to deliver secure land tenure comes about because of lack of a clear-cut monitoring mechanism to check that the flow of plans for numbering and approved survey records is according to procedure. This is so in that there seem not to be clearly defined roles for plan room personnel on who should make database updates although both plan numbering and updating of surveyed parcels is done in the plan room. The graphic updates done by the cadastral drawing office, probably at the same time, cannot be said to cause the delay in the alphanumeric database. This lack of a monitoring mechanism thus leaves room for anyone to pick the numbered plans or survey records before they are updated with or without permission. The 32.1% of ‘exist’ and ‘not exist’ records could therefore be as a result of malpractices. Clearly define the roles on who should be charged with the task of updating the database. Such a person should also have unique rights to the alphanumeric database, which all others might not be assigned. Increase the number of terminals in the plan room for this and other purposes so as to ensure uninterrupted access to the database for the person(s) carrying out the updates. Clearly define what kind of information is obtainable in the plan room and from the Department of Lands so as to free the plan room from an influx of people looking for information they could easily obtain from Lands. This could be done by restricting the kind of information available to the plan room to only survey issues. Put in place a clear watertight mechanism for monitoring the flow of jobs handled in the plan room. Mulolwa’s (2002) integrated land delivery architecture includes a job flow-monitoring module across the entire process. Such a mechanism must have no room for shortcuts. This can easily be done by ensuring that the current scenario where all survey jobs enter and exit through the plan room only after all updates are completed. In case of survey jobs lodged for examinations, a monthly reconciliation of the plan room records and actual jobs handled in the examination section must be undertaken to account for jobs that circumvent normal procedure. Most if not all of the fictitious diagrams produced involve the use of a name of a land surveyor who was or is in government employment. This is because the loose application of this section in ZSD has largely facilitated the malpractitioners use of this section. ZSD does not have enough licensed surveyors and so it just uses names of the few available licensed surveyors even for jobs done without their supervision, which is a clear contravention of the provisions of the Land Survey Act. Such diagrams, which are not signed by the land surveyor but just bear the land surveyor’s name, are many from jobs carried out by ZSD in its 9 Regional Offices. This is a flaw, which has been exploited to the fullest since one does not need a land surveyor’s signature but just typing in the land surveyor’s name suffices even for false surveys. The law only provides for use of section 33 in recompilation involving previously approved survey records. Section 33 reads, in part, that “provided that a general plan or diagram may be approved if it has been framed from an approved general plan or from an approved diagram or diagrams or from approved Survey Records filed in the Surveyor General’s office or registered in the Registry, without the signature thereon of the land surveyor who signed the original general plan or diagram if he is not available or unreasonably refuses to sign the general plan or diagram so framed”. It makes no mention of a new survey being approved using the same section. In fact section 33(2)a is categorical on the matter and states, “subject to the provisions of section thirty-four, no general thereof plan or diagram shall be approved unless it is prepared under the direction of and signed by the land surveyor or land surveyors who carried out the respective survey”. Section 34 only allows approval of unsigned records if they are for consolidation purposes or boundary realignment only. ZSD must adhere to the provisions of the law. The reason why ZSD uses the name of any land surveyor in government employment is not among those provided for under section 33 of the Land Survey Act. ZSD must therefore ensure that every Regional Officer in Charge is a land surveyor. To achieve the level of a land surveyor for every Regional Office, ZSD must have a deliberate policy of grooming its young surveyors to obtain licenses after a well-designed apprenticeship period. The Survey Control Board, though chaired by the Surveyor General must clamp down on ZSD for indiscriminately using section 33 of the Land Survey Act and contravening the law. In the meantime ZSD must restrict the use of section 33 to authority given by the Assistant Surveyor General – Cadastral Services or the Surveyor General only. For surveys involving living land surveyors, every effort must be taken to ensure that they sign the documents as land surveyors are almost always at ZSD looking for information to use in their work. The Land Survey Act, which was enacted in 1960, urgently needs a severe surgery to rid it of undesirable clauses that facilitate malpractices and infuse in new clauses that befit the 21st Century to take care of the changing land administration and surveying technologies. Many people in Zambia dot not want to pay survey fees, which in fact, are not so high. They thus trek to the plan room in the hope that they can bargain for something less. When it is discovered that the parcel was already surveyed but the owner says can only pay a small amount, CTCs are usually the answer using the same notorious section 33 without the consent of the land surveyor who could still be holding on to the diagrams waiting for the no show parcel owner. A mechanism is in place to ensure that the land surveyor accents to the production of CTCs but it is not water tight. Applications for CTCs must go through the land surveyor who originally carried out the survey to the Surveyor General. Where the land surveyor is not available or unreasonably refuses to accent, then section 33 may come into play. Reasons for production of CTCs must be properly laid out with supporting documentation before accepting to issue them. Normally it is the records of dubious surveys, which go missing to erase evidence of the same although some records are just personalised by some people especially officers in ZSD. The reason being that they carry out unauthorised surveys in certain areas but also simply for the love of creating mini archives in their offices. A flawless job tracking mechanism is required to ensure that a jacket position in the whole system is known at any point in time. Survey records must only leave the plan room after being signed for indicating name, date and reason for collection, otherwise consult within the plan room. At the end of the week an officer of the plan room charged with the monitoring of the movement of the records must make a follow-up. Collection of and consulting of certain records must be restricted to a specified group of people only such as land surveyors and line officers in the ZSD. Only land surveyors or their authorised agents must be allowed to collect diagrams from the plan room after approval. Clear and clean up the Plan Room. It is currently in a mess. Create a separate data review and printing section. Employ qualified staff in data and information management to run the Plan Room. There is literally no public reception and complaints procedure system in place. It is even difficult for someone coming to the Ministry for the first time to find their way. Apart from the plan room functioning both as a cadastral survey information archive and reception for land surveyors lodging and collecting their jobs, it also acts as a public reception office for not only the ZSD but also other Departments as people usually call there first before being directed to the right office. This has bred a lot of confusion in the whole system in that the roles of the plan room are not well known as such and monitoring of its activities are difficult when there is always an influx of the public looking for this or that. The Plan Room must be a cadastral survey information archive and a specialised reception office for services needed by land surveyors and line officers in ZSD. It will then be able to offer services that it should to the right people and at the same time be able to monitor its activities better than now. There must be therefore another public reception office for the ZSD or Ministry that can act as a filter for all clients that visit ZSD or the Ministry. This will also help in reducing incidences of tempting offerings to various officers who at the moment directly come into contact with the public. Mulolwa’s (2002) integrated land delivery architecture incorporates such a front desk idea. Knowing the output of other line Departments in the ministry is very important if a conflict free product (title) is to be realised and dubious records are to be quickly detected. At the moment the Lands Department that receives the approved diagram to prepare a certificate of title, does not know whether what they receive is authentic or not. As such there are even cases where titles were prepared based on dubious diagrams. There is need for cross Department awareness campaigns to simply enlighten those directly or indirectly receiving information or documents from other Departments, which are inputs in their work. They need to know what to expect and in what form. That way they will be able to tell the difference between an authentic document and a dubious one. The present database system must be enhanced into an integrated GIS, which both Chilufya (1997) and Mulowa (2002) advocate. Through such a system, which integrates survey graphic data and land records, each operator in the system of land delivery will have access to view the records they need and take their action based on it. Certain safeguards can be built in into the system to ensure integrity of information therein. For example, information about a parcel of land could be available from the time an offer is made with additional information being added as it is being generated such that at every stage any operator in the system would know at what stage the process for a particular parcel is, thereby enabling them to make an informed decision and advise the client accordingly. And since information shall be input by people given rights to do so cases of fraud will be easily detected and nipped. Decision-making shall also be greatly enhanced with such an approach. Most of the malpractices in cadastral surveying are perpetrated by people who are not qualified to do the job. These are normally people in the allied professions who in the course of their work come across cadastral related work. But instead of referring it to the experts they take it up and use fellow unqualified people who use short cuts to get to the product required. Such people have flourished because of the laxity in enforcing the law and the sheer ignorance of those that give them such jobs. Enforce the provisions of the Land Survey Act by prosecuting those that contravene the law. Mount awareness campaigns for the public using all effective media channels to enlighten the public on the need to use land surveyors for cadastral surveys. Further enlighten the public on what it takes to produce a diagram and consequences of using unqualified people and dubious methods to obtain a survey diagram. It is important to tell the public that Cheap is usually expensive since the job, in case of a fictitious survey, must be redone at the owners cost. Encourage land surveyors to get involved in educating the public, especially the venerable groups e.g. women, on the process of getting title to land as their contribution to society through which society’s attitude could be influenced towards the concept of sustainable development [FIG Agenda 21]. Such activities must therefore be recognised by professional bodies as part of CPDs. Land surveyors must socially integrate themselves in societies they live so that the public know what they do best. Such involvement of land surveyors in public awareness campaigns will thus go a long way in contributing to the achievement of FIG Agenda 21. The effects of these white-collar malpractices in cadastral surveying are immense and costly. In most cases land developers have had to lose out on developmental projects they started on land that was later found to have irregular documentation. In some cases building structures have had to be demolished with no compensation at all or well-cleared farmland repossessed. All because short cuts in the process were sought through resorting to malpractices. For example within this year not only was property lost in the Kalikiliki demolitions, but also life. In 1991 and 2002 property was lost in the Kanyama and Kamanga demolitions [Kalikiliki, Kanyama and Kamanga are all unplanned settlements in Lusaka]. All because of the development were not secure and therefore unsustainable. Had all these been secure with title based on properly executed cadastral surveys, the loss could have been avoided. In a country that is grappling with a high poverty levels, such loss of scare resources through malpractices in the process of land delivery has a very devastating effect in that the majority of the people are denied access to land and security of tenure, which are very important prerequisites for the provision of shelter for all. Consequently this translates into a great denial of the development of sustainable human settlements in a country where there is virtually no residual income. Hence a denial to break the vicious circle of poverty which, is continually killing our society [FIG Agenda 21]. In an effort to role back malaria, mosquito-spraying campaigns in unplanned settlements failed due to lack of proper maps to plan and monitor the process. Maps in such areas are usually a product of cadastral surveys. Disease control is therefore a difficult task where illegality reigns. Where landowners are spared of repossession or demolition, they have had to foot the bill for a resurvey to correct the wrong, while losing out on their first or indeed second payment of the dubious survey. All this at the cost of diverting developmental resources into a process that could have been done right the first time. The administrator of a named farm contracted 2 others who did not deliver the required service before she settled for the author and paid all the three. In cases where development takes place the economic effects are also immeasurable since it becomes extremely difficult to turn such assets into liquid capital thereby hindering acquisition of the much-needed capital for new investments. Correction is usually at great cost both in terms of direct payments for correction as well as in terms of loss of what might have been a lifetime investment opportunity. The greatest effect is that of loss of confidence in the land delivery system by the main players such as development financing institutions. When the documents that guarantee security of tenure become questionable, securing financing opportunities for developmental projects becomes difficult. Where they are accessed, it is again at an additional cost because such players will ask for or carryout additional checks before rendering any assistance. In addition when confidence in a system is lost, illegality takes root [Mulolwa 2002]. This then breeds anarchy in that development is unplanned and haphazard. In such a scenario it therefore becomes difficult for central or local government to control development in this age where even illegal developers can seek protection of the law leading to lengthy and costly legal battles in courts of law. Moreover, environmental concerns cannot be addressed when development itself cannot be controlled. Even the much needed provision of services and collection of revenue is difficult in such circumstances. All these effects sum up to an unsustainable development as everybody loses confidence in the system. Environmentally, this has led to development that does not take into account the well being of the surroundings within which it is occurring. Hence degrading it to levels, which require diversion of huge amounts of resources to correct. Yet such diverted resources could otherwise be used to sustain society. For example, the Kalikiliki Dam, at one time the home of a once vibrant Lusaka Yachting Club is slowing being suffocated by encroachments of illegal settlements. Many dambo (swampy) areas are now illegally built up; disturbing the natural environment of any aquatic life there was in these areas. Secure and sustainable development can only come about when there is order in the land delivery system. At the moment there is a lot of anarchy in this process that needs to be addressed urgently. Knowing that security of tenure is a critical factor of sustainable development must propel us further to ensure that the system that delivers that security is flawless to build confidence and facilitate economic development. The operations of the Plan Room and Examinations Section need to be streamlined to make the survey diagram approval process watertight. In addition, there is need to separate the plan room from a public gallery that it now seems to be by providing a separate general public reception office. The Surveyor General, the Assistant Surveyor General – Cadastral Services and the Government Surveyor approving cadastral surveys must have access to the enhanced database records (GIS) so that they are better informed as they carry out their tasks. The same is true for all desk officers in Lands and Registry Departments. This will only have an impact if the present system is developed into a more transparent GIS that shall afford particular officers only that information they need to work on or view. There is therefore need to reengineer the present system on the lines recommended by Mulolwa (2002) and Chilufya (1997). Such a GIS will stem a lot of malpractices with its inbuilt safeguards, which to some extent the present system is lacking. There is also an urgent need to overhaul the Land Survey Act, CAP 188, and related legislation to facilitate smoothening the process of the entire cadastral surveying system. In its current state, the Act is somewhat a bottleneck in the land delivery system (The proposed amendments that were proposed some 3 years ago have been overtaken by events). In line with the pledge made in the 1996 Land Policy Document, the Ministry must facilitate a quick review of this Act. ZSD must stop abusing section 33 of the Land Survey Act. It has been a major facilitator of the fictitious surveys that have occurred. ZSD must therefore embark on retraining their young land surveyors towards getting licensed. An increased number of land surveyors, from the present 30 country wide, will also help curtail this dirty trend of mushrooming fictitious surveys. The Survey Control Board must also ensure that this scenario of about one land surveyor per 350,000 inhabitants is greatly improved by devising deliberate apprenticeship programmes for the profession. It is not enough to just rely on a natural flow events when we are a country in crisis. The Survey Control Board must also clamp down on all illegal activities in the profession regardless of the perpetrators. Poverty is a chronic disease eating away the fabric of our society and affects both the haves and the have-nots. In Zambia, the single resource that we have in abundance is land. Everywhere in the world economic activities take place or start taking place on land. For us to economically prosper, there must be security for rights held in land by various players in the economy so as to facilitate economically sustainable development that has the well being of the environment in mind. This is achievable through the involvement of the land surveyor in fulfilling his or her part in a conflict free land delivery process by providing reliable survey data upon which a certificate of title, that ensures secure holding in land, is based. When this process is infested by malpractices security of tenure on which sustainable development and hence economic empowerment depends, shall remain a pipe dream and our society shall forever remain impoverished despite the abundance of the major component of developmental capital – land. This research has brought out issues that were previously just being talked about in passing so that something can begin being done to nip this budding problem before it gets out of hand. Sustainable development depends on access to appropriate information at the right time in the right form for critical decisions to be made. Some of this information is delivered through cadastral surveying, which is in turn used for property tax, land rent and rates collection, location of utilities installations and provision of vital services such as ambulance and fire services. The Lusaka Water and Sewerage Company limited, has shown that use of cadastral information could be beneficial. Using cadastral maps based GIS, the utility is able to sustain its operations through a billing system that catches all its clients by location, timely location of faults to properly maintain its infrastructure and to timely plan future developments with an environmental friendly touch. These are some of the benefits of properly functioning cadastral surveying system. It is therefore hoped that the findings and recommendations of this research shall become a vital piece in our quest to improve the administrative, technical and legal aspects involved in the land delivery process, especially those addressed in this research. It is also hoped that, having sanctioned this research, the Surveyor General shall employ its findings and recommendations into improving the survey part of the land delivery system. The Ministry at large should also use these findings to streamline the cross Department counter checking system before using a particular product as an input in their own part of the land delivery system. The Author would like to acknowledge the financial support from the FIG Foundation in Copenhagen and material support from the Department of Geomatic Engineering at the University of Zambia (UNZA), without which carrying out this research would have been very difficult. The willingness to give information by all those interviewed is also highly acknowledged as they made the research successful. The efforts, encouragement and assistance of Chama Manda and Yamikani Mwanza in carrying out this research are equally highly appreciated too. The encouragement the author received from the Surveyor General, his assistant for cadastral services, the School of Engineering Research Coordinator, UNZA and the President of the Surveyors Institute of Zambia (SIZ) is also acknowledged. Dr A Mulolwa is being acknowledged for reviewing this report at short notice and indeed all those who contributed directly and indirectly. Chileshe R A., 1994, A Low cost approach to Cadastral and Land Registration for the customary Lands of Zambia with emphasis on data acquisition, MSc Thesis, ITC, Enschede. Chilufya S M., 1997, From Manual to Integrated Cadastral and Land Registration Information Systems – A Zambian New Legal Challenge, MSc Thesis, ITC, Enschede. Dale P F., 1976, Cadastral Surveys within the Commonwealth, HM Stationery Office. Land Survey Act CAP 188 of the 1995 Edition of the Laws of Zambia. Minango J C., 1998, Introducing a “Progressive” cadastre at the Village as a Toll for Improving Land Delivery – A Case Study of the Customary Areas of Zambia, MSc Thesis, ITC, Enschede. Ministry of Lands, 1996, Land Policy Document, Government Printers. The following team carried out this research. Principal Researcher, Mwanza, Alick R (B.Eng, MSc). Lecturer in the Department of Geomatic Engineering at the University of Zambia and a holder of a Cadastral Surveying Practising License. Currently Vice President of the Surveyors Institute of Zambia (SIZ) and Vice Chair for the Zambia Association of Geographic Information Systems (ZAGIS). Was also Secretary to an ad hoc committee that recommended amendments to the Land Survey Act. Research Assistant: Chama, Manda (B.Eng). GIS analyst at the Mining Sector Development Programme (MSDP) and first ever female Land Surveyor from the University of Zambia. Yamikani Mwanza. Geomatic Engineering 2nd year Student, University of Zambia. Appendix 3: Parcel Numbers that Retruned "Exist" or "Not Exist"